Ministry of Tourism is organising 'Bharat Parv' in the north and south lawn of Rajpath between Man Singh Road and Janpath New Delhi. 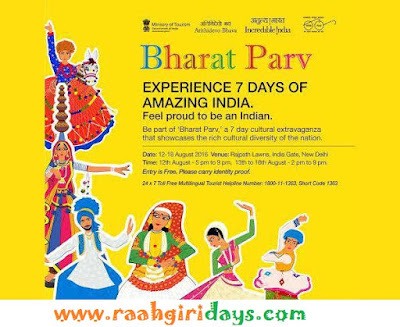 'Bharat Parv' will be inaugurated on 12th August 2016 at 5.00 pm and will be open to public and tourists on other days at 2.00 pm and will continue till 9.00 pm on the 18th August, 2016. Its objective is to create festive and patriotic mood across nation and greater participation of the general public. Dr. Mahesh Sharma, Minister of State for Tourism and Culture visited the venue of "Bharat Parv" to inspect the arrangements at various stalls. He personally monitored all the arrangements and instructed the staff there for timely completion of all such arrangements including safety and security of the public and tourists. Bharat Parv will display the cultural, cuisine and handicraft of various States, Regional Associations, Sangathans, Cultural and Social Organisations etc. There will be 50 stalls dedicated to cuisine of various regions of the country and 50 more stalls will display the colourful handicrafts and handloom items. In addition, there will be 12 to 15 separate pavilion earmarked for States to display their tourism products, culture & heritage, achievements, development progress, etc. The states of Andhra Pradesh, Tamil Nadu, Assam, Rajasthan, Gujarat, Madhya Pradesh, Nagaland, Uttar Pradesh, Punjab, Odisha, Haryana and Kerala will bring local association and sangthans to showcase diverse yet united flavours of the country. Event would also have performance by Armed Forces Bands and Illumination of India gate. raahgiri gurgaon photo album 21st august 2016.